Wondering where to go in India during the summer and monsoon months (May – September)? 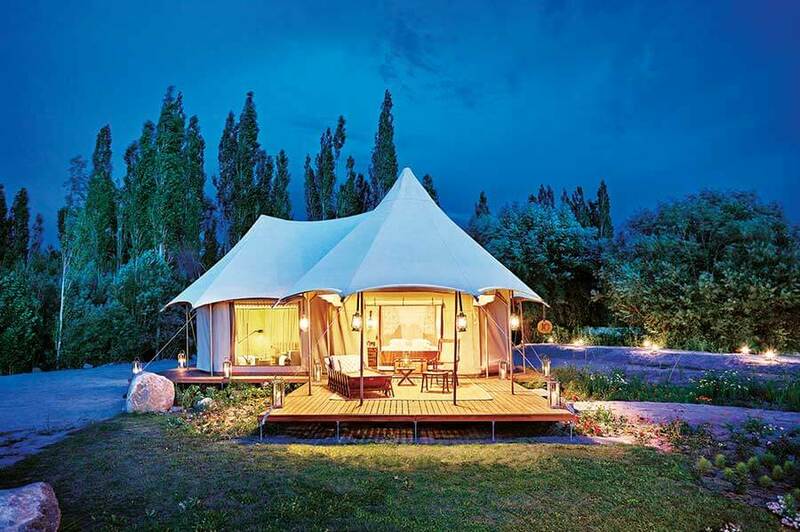 Why not delve into one of its most beautiful and hidden corners, soaking up the spectacular landscapes and spell-binding Buddhist culture of Leh Ladakh, from the comfort of your nomadic 5-star home, ‘The Ultimate Travelling Camp’. 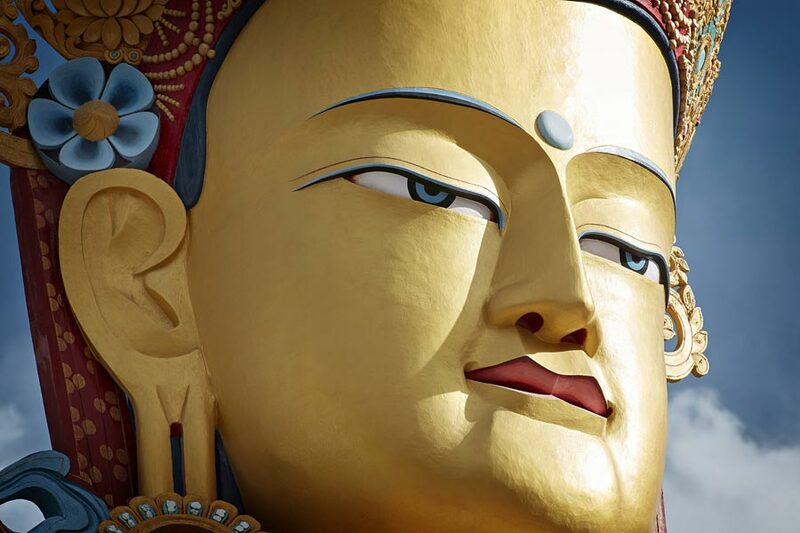 Leh, the capital of Ladakh, is often referred to as ‘Little Tibet’ and this wild and beautiful region is nestled between the Kunlun Mountains and the Himalayas. Close your eyes and imagine lush green valley’s rolling up to jagged mountains, with a backdrop of high snow-capped peaks. Peppered with Buddhist monasteries, gompas and stupas, colourful Buddhist prayer flags flap around every corner. 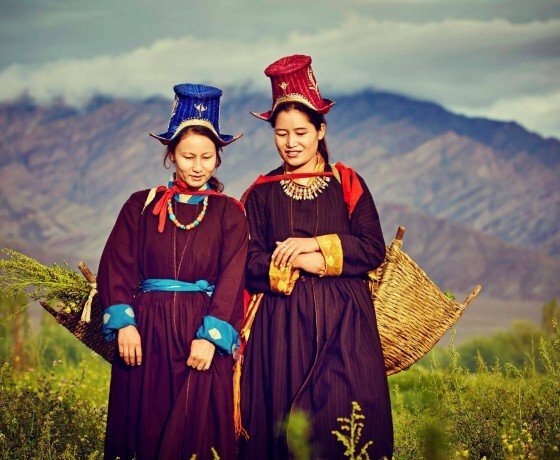 Simply put, dream-like Ladakh offers a mesmerizing combination of amazing views with rich culture and history. Nothing quite prepares you for the soul-stirring scenery, and it’s impossible not to be moved by the blue lakes, ice-capped mountains and lush valleys. 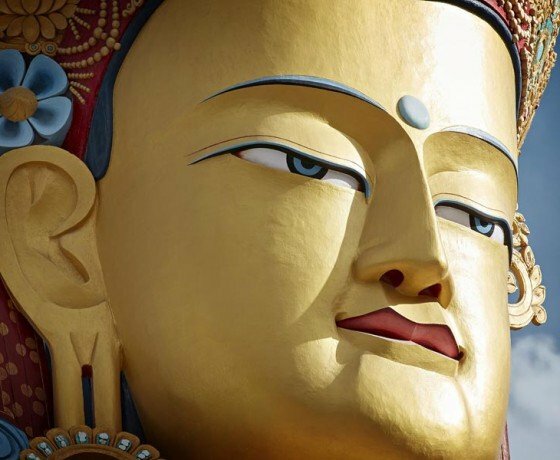 With a night in Delhi either side, this luxury tour invites you to unfold the ancient culture of Ladakh, explore her captivating monuments and monasteries and embrace her centuries-old rituals. In 2018, our Leh Ladakh Luxury Tour is operational from 15th May to 30th September. Your Leh Ladakh Luxury Tour kicks off upon your arrival in Delhi, where you will be met by a member of our team and chauffeured to the Lodhi for a two-night stay. Previously part of the Aman group, the Lodhi is arguably the finest hotel in New Delhi. It’s nestled in a busy but green area of the capital, close to the Lodhi Gardens of which it takes its name. The atmosphere here is cool and hushed; the décor is sleek and minimal. Rooms are huge and come with their own private plunge pool. With an early start you’ll fly out to Leh, Ladakh. 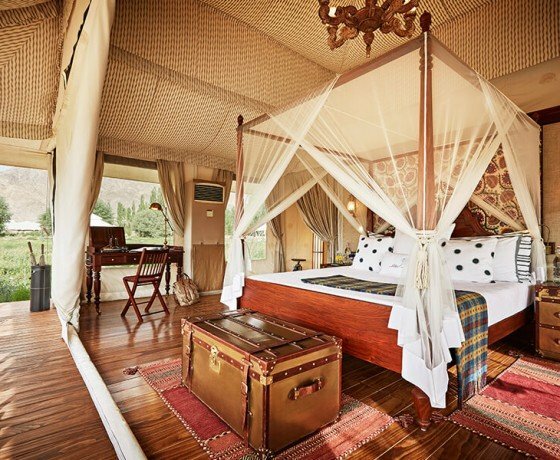 On landing, you’ll be chauffeured to the Chamba Camp, Thiksey, to check-in for a three-night stay. The remainder of the day is at leisure to settle in, soak up the views, and acclimatize. At your convenience, a member of the camp will fine-tune your itinerary and excursions with you to complement your tastes and interests. Dinner will be included this evening, as are all meals during your in Ladakh. The morning’s at leisure to enjoy your surroundings. If you’re feeling active (and well acclimatized), optionally do a bit of bird watching with the camp’s resident naturalist. 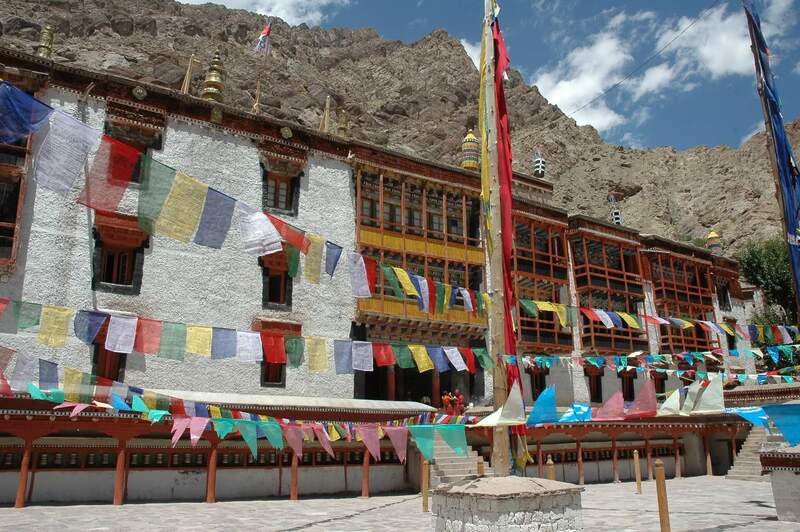 In the afternoon, proceed on a gentle, guided orientation tour around Leh, visiting popular landmarks such as the 17th century Leh Palace, the Ladakh Arts and Media Organisation Centre, and Munshi House. After special Ladakhi tea, the heritage tour continues through the old city and bazaar on foot, ending with a spectacular view from Shanti Stupa to watch the sunset. Rise early this morning to explore Thiksey monastery. This stunning monastery houses an impressive two-storey statue of the Maitreya Buddha seated on a lotus and boasts a mesmerizing view of the valley. Whilst at the monastery, you’ll have the privilege of participating in the sunrise prayers. Later today, visit the 11th century Alchi monastery and 16th-century Basgo Fort, which bears horrific evidence of the invasion of the Mongols. Alternately, combine your visit to the Alchi monastery with rafting down the River Indus. On a scenic drive today you’ll continue through dramatic landscapes over the Khardung La Pass (considered the highest motorable road in the world) and the famous Nubra sand dunes. Your destination is the Chamba Camp in Diskit. After having settled in, this evening embark on a visit to the Lamdon Charitable School. Housing 150 students from as far away as the Nubra frontier, meeting and hearing the stories of these little children is an amazing experience. 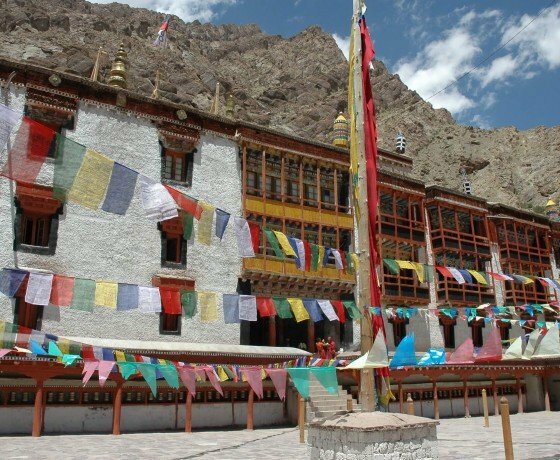 With an early start this morning you’ll explore the Diksit Gompa: perched on a hill in the village, it’s considered to be the oldest and largest Buddhist monastery in the Nubra valley. In the afternoon, embark on an exhilarating ride over the dunes on the native double hump Bactrian camel. Optionally continue into the evening with a visit to Chamba House. An old heritage home which used to belong to a Silk Route era trader, Chamba House is embellished with exotic frescos. 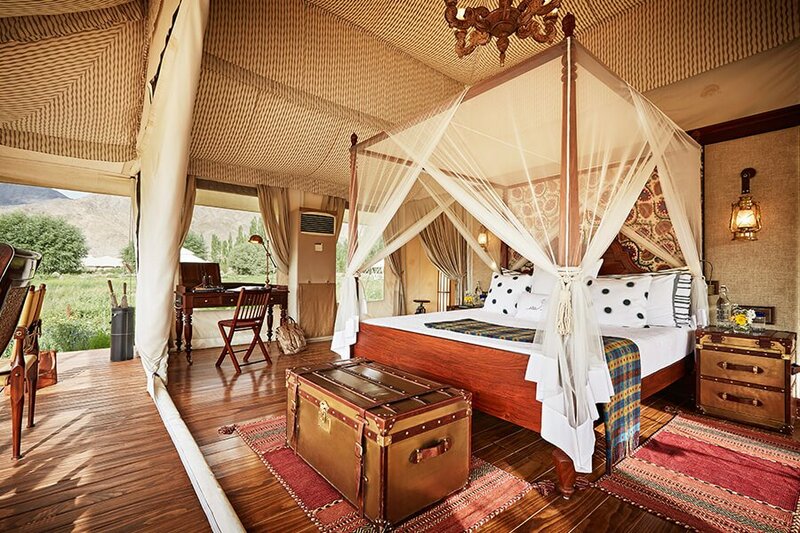 Take it easy this morning to relax at the Diskit camp. 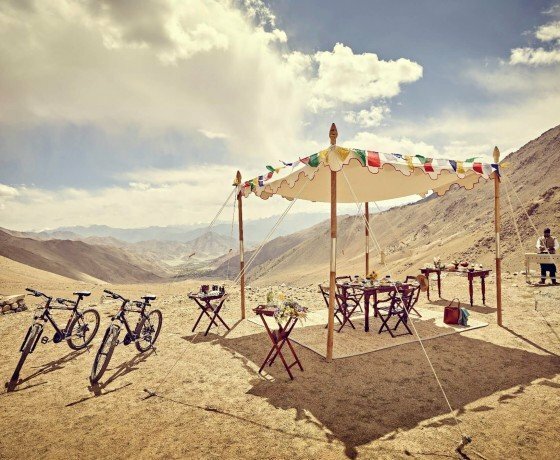 If you’re feeling active we’d recommend cycling over to the Yak Breeding Centre and Fishery, which are vital units to Nubra, ensuring a continuous supply of animal husbandry, winter after winter. 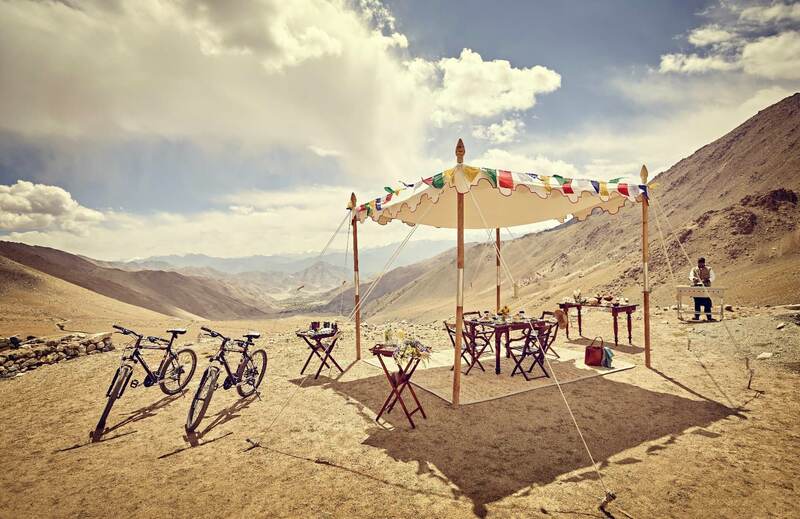 In the afternoon, return to the Thiksey camp in Leh for a two-night stay. The day is at your leisure relax, enjoy the camp, and explore the local area at your own pace. Alternately, embark on an optional excursion to Pangong Lake – a popular location for many Bollywood films – to take in stunning lake views amidst a backdrop of the Himalayas. This morning you’ll be chauffeured back to Leh airport to board your return flight to Delhi. Upon landing in Delhi, a member of our team will accompany you to back to the Lodhi for the last night stay. Enjoy your private plunge pool this afternoon, or embark on some gentle sightseeing with a guided walk around the Lodhi gardens. You’ll be chauffeured back to the airport this morning in time for your onward flight. 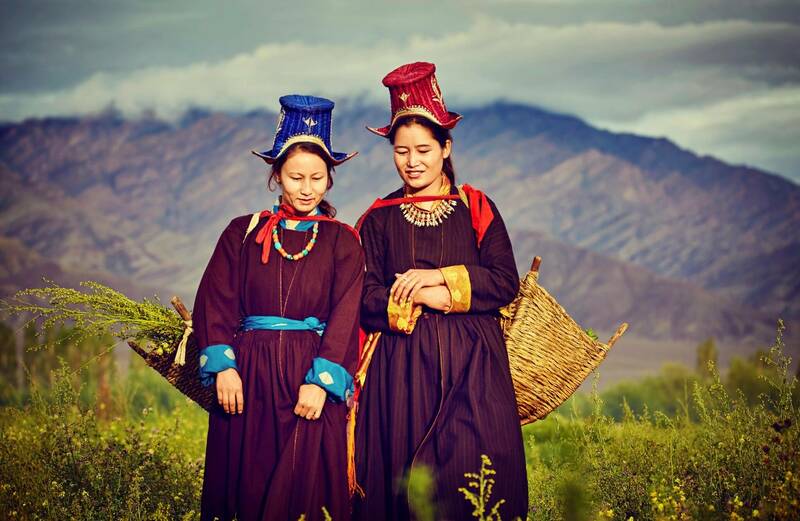 Our Leh Ladakh Luxury Tour is tailor-made and can be refined to complement your preferences. The Lodhi in Delhi is merely our suggestion and can be tweaked to better suit your tastes (you might prefer the Imperial, the Leela Palace, or the Oberoi). We have a range of wonderful properties to recommend to suit all budgets. Similarly, we would encourage you to ask for any number of amendments – every aspect is flexible, from the accommodation to the destinations to the length. 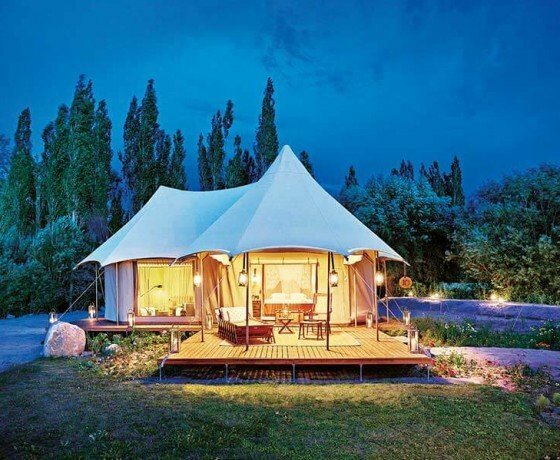 For example, you may prefer to shorten your stay to the Thiksey camp only, or you might like to add a visit to the Taj Mahal in Agra after having arrived back in Delhi. The possibilities are endless. Our Leh Ladakh Luxury Tour is available from the 15th May to 30th September 2018.